Co-Optimus - News - 8-Bit Left 4 Dead Finished, Now Available, Has Co-Op! 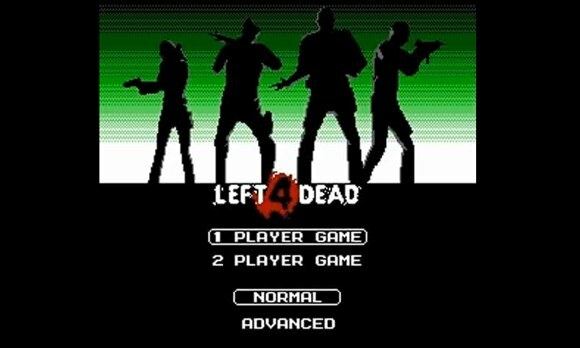 8-Bit Left 4 Dead Finished, Now Available, Has Co-Op! Sometimes, glorious nostalgia merges with modern artistry, and awesomeness is the result. Such is the case with the unofficial "de-make" of Left 4 Dead. Named Pixel Force: Left 4 Dead, it's an 8-bit answer to the question, "What if Left 4 Dead was made in 1988?" The official site for the game is down at the moment, no doubt due to the mad downloading frenzy of Left 4 Dead fans. In the meantime, you can download Pixel Force: Left 4 Dead, with glorious two player couch co-op, right here.